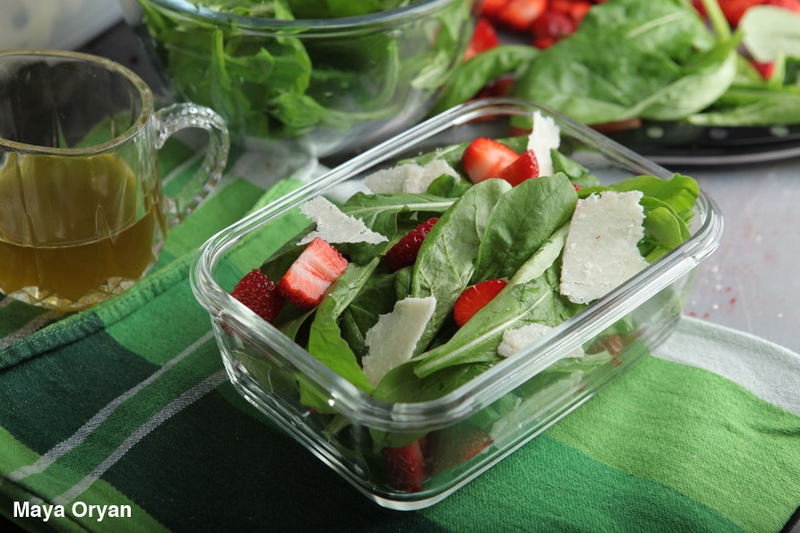 Rocket leaves (arugula), Parmesan cheese and strawberries. Really, what’s not to love about that? I mixed up all 3 ingredients, sprinkled little salt, drizzled oil and balsamic vinegar and my lunch box is ready! I’m sue you all had in your life rocket leaves salad with Parmesan, mushrooms, tomatoes or bresaola, but did you try it with strawberries or blue berries? Delicious! I have a photo shoot today and the schedule is tight. A quick light salad to munch on is an enjoyment on my little break. See you later! Mix all ingredients, rocket leaves, berries and Parmesan. Sprinkle with salt and drizzle with oil and vinegar. This entry was posted in Recipes and tagged food photography, Food Stylist, lebanese food blogger, Maya Oryan, rocket salad, Salad, strawberry salad by Maya Oryan. Bookmark the permalink. yummmm that surely looks delicious! the mix of strawberries and rockets with balsamic vinegar is just taaasty!!! never thought about this combination! love everything about it!